When midday cravings strike, FiveStar has delicious hot food to satisfy your hunger. We offer you juicy burgers, crispy chicken tenders, spicy jalapeño poppers and everything in between. If you’re looking for something cool, check out what’s Available Anytime. 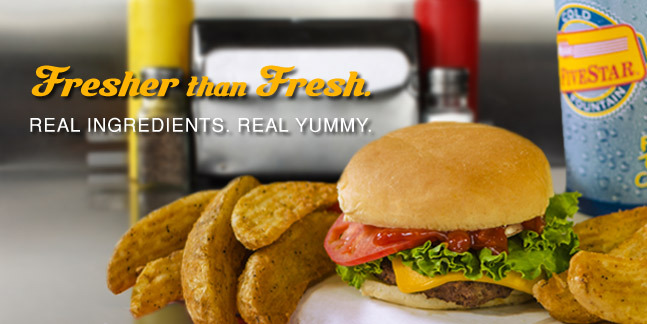 Hamburgers Our juicy burgers come just the way you like them: just the burger, with cheese or with a kick! Enjoy them alone, or paired with our delicious potato wedges. Sandwiches We have all of your favorite hot sandwiches to make lunchtime a treat. Try BBQ Pork Ribs, Country Fried Steak, Sloppy Joe or one of our other surprisingly delicious options. Deli Items Make a meal or just a snack out of our delicious array of hot deli items. Chicken tenders, jalapeño poppers, pizza puffs and much more await your enjoyment.